Reliance VFM High Intensity Mixers are available in sizes ranging from 4 to 2000 Liters. From lab units to production units, Reliance mixers use tools that are belt driven with the use of pulleys and a vertically integrated motor to blend PVC,Color Concentrates, Toner, and other material in need of high shear and high frictional energy. A full batch, which can include the introduction of PVC Resin, Calcium Carbonate, TiTO2, Plasticizers, Modifiers, and other ingredients,can be fully mixed in under 6 minutes. Typically in a PVC application Resin is introduced and brought up to a temperature that will allow its pores to open up and absorb the other additives. The material changes form throughout the batch from a liquid paste to a dry powder as different ingredients are added throughout the cycle. As a consequence the motor amps start to change as the material gets closer to its drying out point. PVC Mixers run at fast speeds and run round the clock. They are the work horse of a plant and are integral to the Blending System. For efficient usage Reliance PVC Mixers are typically specified out to run at a minimum of 40 Meters per second. Reliance PVC Mixers have a minimum of (3) Mixing Blades that run at a high speed to get material to the proper temperature throughout the batch to properly absorb and integrate all ingredients. The Blades are facilitated with a Lid Mounted or Side Wall Deflector that pushes material back in to the center of the bowl. 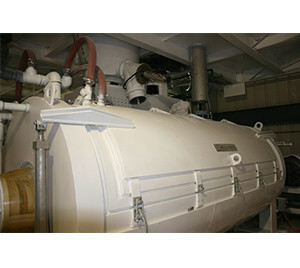 PVC Mixers work in conjunction with our Cooling Mixers. 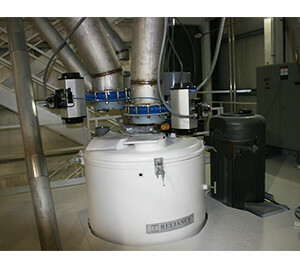 Reliance Cooling Mixers come in either in a Vertical or Horizontal design. The Cooling Mixers receive material from the PVC Heat Mixer that can be upwards of 245 degrees F. The Cooling Mixer is jacketed for the circulation of Chill Water that reduces the material temperature down to 140 degrees or less. At this temperature gets below 160F the plasticizer becomes fully absorbed and encapsulated with the resin.